As a kid growing up in Guyana, South America, and then in Queens, N.Y., middle child Mark Primus was someone that his four siblings turned to when they were having difficulty. He appreciated the trust they put in him, kept quiet about what they shared, and liked the role of peacemaker and advisor. "I felt that I was helpful," says Primus. That was the spark for his passion for social work. In a family and culture that valued education, Primus first pursued a bachelor's degree in sociology — "It's all about the idea of people and learning about society" — and then a master's in social work, a profession that gave him great flexibility to help people in various settings. 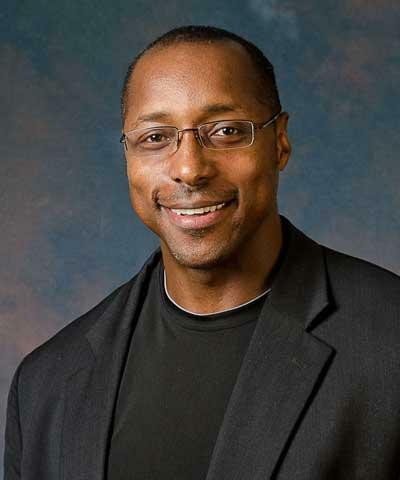 His 30+ years of experience includes counseling children and families at Hillside Family of Agencies, Rochester City School District, Strong Memorial Hospital, Urban League of Rochester, Center for Youth Services, and the Rochester Police Department. He also worked as a private consultant for Juvenile Probation, Hillside, and for Kenyon International Emergency Services. He's been guiding and pushing Nazareth students toward success since 2004. He builds relationships with students and enjoys when they keep in touch and check in for advice during their careers. Develop self-awareness. "You have to really know where you stand with your morals and values. Sometimes, as beginning social workers, we push our own values and morals on clients without even realizing it. You need to know what you are bringing to the table while you are interacting with clients. Know who you are, know what your values are, and how that may affect your work with clients." "My favorite classes to teach are about human behavior, human rights, and fathering," says Primus. His research focuses on fathering; his dissertation looked at paternal and maternal warmth and physical punishment and their associations with child outcomes. In more than 65 countries, he saw the same results: "It doesn't matter where we live, physical discipline always has poor outcomes." He also thoroughly enjoys teaching International Social Work courses in Jamaica and India. By engaging in community service abroad, students build skills in connecting with other people and realize their perspective is not universal: "Your clients, the people you're working with, see the world differently." Students also learn from different professors. In Jamaica, faculty from the University of the West Indies give lectures each night for the Nazareth students, providing a new lens on community violence or sexual orientation. Dr. Primus teaches courses with service-learning components, which have included both India (photo: near the Taj Mahal) and Jamaica for Nazareth undergraduate and graduate social work students. In India, Nazareth students have had the opportunity to help plan an international social work conference. Primus earned a black belt in taekwondo and has competed at the national and international level. "Dr. Primus is an incredible professor and person who is always there for his students. Dr. Primus led our class to Jamaica in March 2018 and allowed us to experience the country for ourselves, while bringing in incredible lecturers at night. In class, Dr. Primus leads thoughtful discussions, forces students to think for themselves, and allows differences in opinions to come to the surface and be explored. Dr. Primus has helped me personally in so many ways at Nazareth, and has helped me put together a Fulbright application to return to Jamaica and work with a psychiatrist, by assisting me in making connections there."